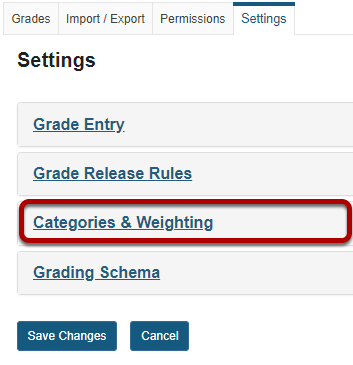 Sakai Guides and DocumentationFaculty Guide Gradebook BasicsHow do I set up a Gradebook with categories and weighting? The percentages of all the weighting must add up to 100% . It is easiest to set up your gradebook first, and then create or add items to the gradebook. 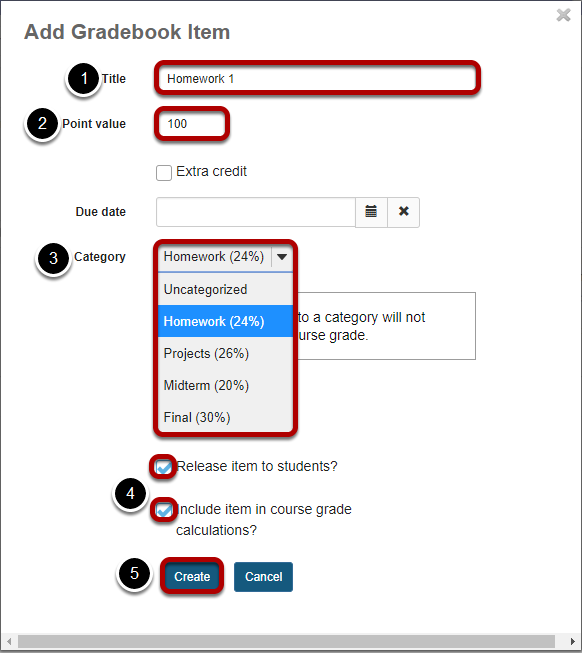 But don’t worry, if you have already set up your gradebook items (homework assignments, projects,etc), you can come back and do this setup later and then assign the gradebook items to the appropriate categories. 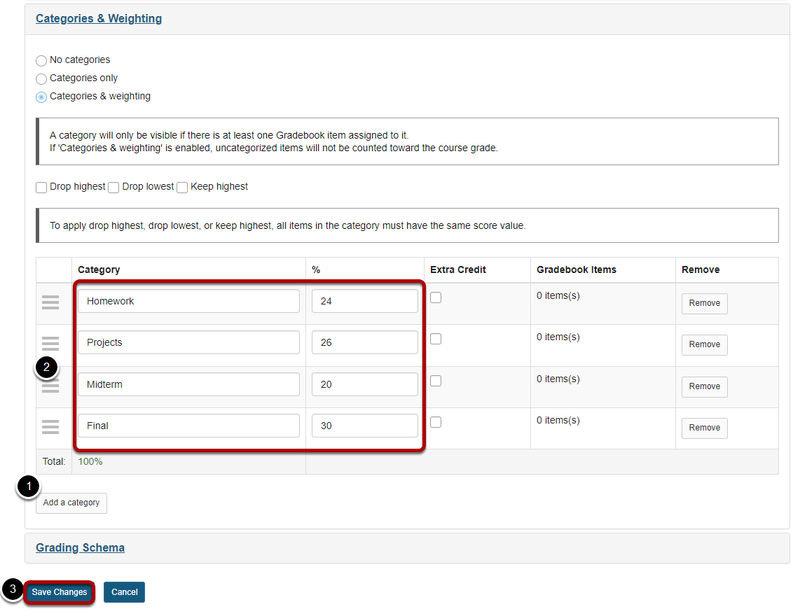 It is also easy to add categories and even change the weighting of grades at any time. Click to expand the Categories and Weighting section. Select the Categories & weighting radio button. Zoom: Select the Categories &amp; weighting radio button. Additional options will display once you select categories and weighting. Enter categories and percentage weighting. Zoom: Enter categories and percentage weighting. Click the Add a category button to add more categories. For this example, enter each category as follows: Homework 24%, Projects 26% , Midterm 20%, and Final 30%. Click Save Changes when you finished adding categories. 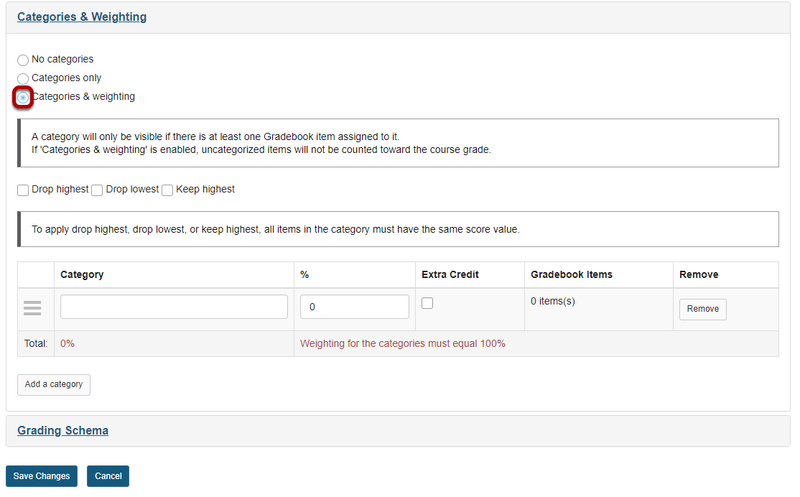 Click Add Gradebook Item to create items and associate them with the appropriate categories. You will end up adding 7 gradebook items: Homework 1, Homework 2, Homework 3, Project 1, Project 2, Midterm, Final. The title for the first item is shown in the image above. For the sake of this example we will assign 100 points for every item. Make sure to assign each gradebook item to the appropriate category. All three Homework items should be assigned to the Homework category, both Project items should be assigned to the Projects category, the Midterm to the Midterm category, and the Final to the Final category. It may not feel intuitive to have categories with only one gradebook item but having all the grades accounted for at the category level is what allows us to control the weighting. Be sure to check the boxes next to Release item to students? and Include item in course grade calculations? for each item. Click Create to save the item. Note: You may also assign items from other tools, such as Assignments or Tests & Quizzes, to specific categories when you create them. How does it come up with 89.61%? Midterm and Final only have one grade in those categories, therefore the category average is equal to the score / points possible (90 / 100 and 95 / 100 respectively). The category weighting is set up with the scenario percentages. That each gradebook item is assigned to the correct category. 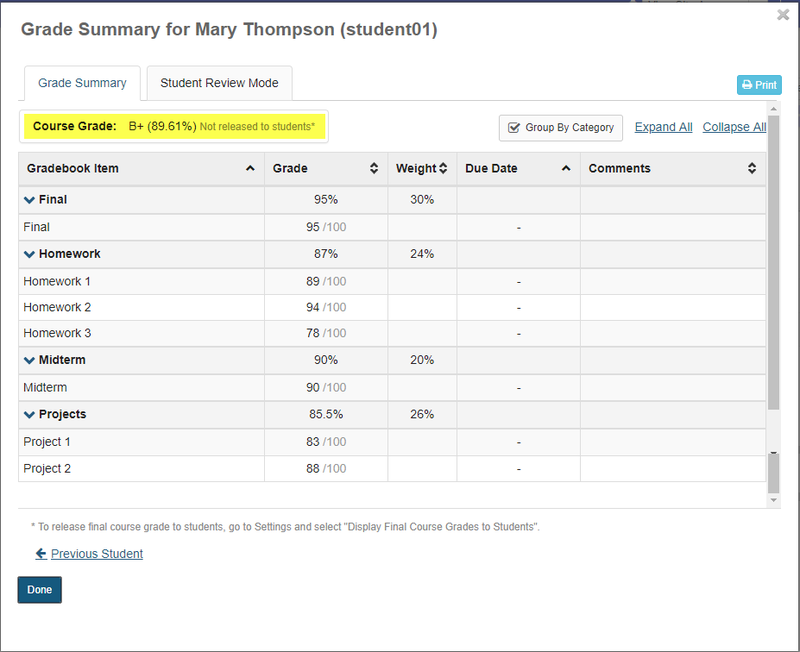 That each gradebook item is released to students and included in gradebook calculations (two checkboxes). The student grades were entered correctly. Prev: How do I set up a Gradebook with categories for organization and/or dropping grades? Next: How do my Library E-reserves work in Sakai?